Specificity The antibody is a rabbit polyclonal antibody raised against TGFb1. 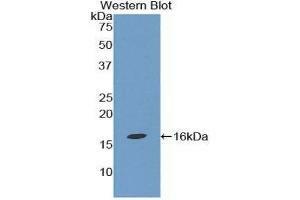 It has been selected for its ability to recognize TGFb1 in immunohistochemical staining and western blotting. Western blotting: 1:50-400 Immunocytochemistry in formalin fixed cells: 1:50-500 Immunohistochemistry in formalin fixed frozen section: 1:50-500 Immunohistochemistry in paraffin section: 1:10-100 Enzyme-linked Immunosorbent Assay: 1:100-1:5000 Optimal working dilutions must be determined by end user. Buffer PBS, pH 7.4, containing 0.02 % Sodium azide, 50 % glycerol.